Shortly before Easter 1900, a Greek sponge diver off the small Aegean island of Antikythera discovered the wreck of an ancient ship filled with artefacts, including bronze and marble statues, dating from 85 to 50 BCE. Among the numerous finds, a small formless lump of corroded bronze and rotted wood lay unregarded at the National Museum in Athens for years. As the wood fragments dried and shrank, the lump split open to reveal the outlines of a series of gear wheels resembling clockwork. Gamma-ray photography allowed the historian of science Derek de Solla Price (1922-1983) to reconstruct the machine’s original appearance. The gear wheels were proportioned to show the movements of the sun, moon and planets. The gears could be moved backwards and forwards, making the device a calculator that could show the positions of planets in the sky at any required date. It is nothing less than an orrery, a device well known in the Middle Ages. Further research carried out between 2006 and 2010 has enhanced our understanding of the Antikythera mechanism, revealing its high level of accuracy and enabling most of the text inscribed on its surface to be read. Although the device is a remarkable achievement, its status should not be exaggerated. We know that the principles of gearing were understood in the Classical world and what is surprising about the Antikythera mechanism is its uniqueness: no similar gearing mechanisms have survived from antiquity. Nevertheless, we know from the Roman statesmen Cicero (106-43 BCE) that his older contemporary, the astronomer Posidonius (c 135 BCE–c 51 BCE), built such a device. The mechanism is unlikely to have been built for purely scientific purposes, but is more likely to have been part of an astrologer’s toolkit as well as being based around the four-year Olympic cycle. It does not show a Copernican solar system, with the planets revolving around sun, but a Ptolemaic system, with the sun and planets revolving around the earth in complex motions and it has been suggested that it is rooted in Babylonian astrological belief rather than Greek. Calling it a ‘computer’ rather than an ‘orrery’ only serves to make it sound mysterious and out-of-place! “It is nothing less than an orrery, a device well known in the Middle Ages.” Oh dear! Never send an archaeologist to do an historian’s job! The Antikythera mechanism is not an orrery but rather it is a planetaria. The definition of an orrery is “a mechanical model of the solar system in which the planets can be moved at the correct relative velocities around the sun.” (Collins, Complete and Unabridged. 2003). As you correctly state in the above text the Antikythera mechanism “does not show a Copernican solar system, with the planets revolving around sun, but a Ptolemaic system, with the sun and planets revolving around the earth in complex motions”. As for the orrery having been a well known device in the Middle Ages, well, unless it is now common practice for archaeologists to extend the Middle Ages right on through the Renaissance, the Age of Reason and on into the Enlightenment then I fear that you have erred once again! The first written evidence of the existence of heliocentric planetariums which would qualify is, of course, post Copernicus, late C16th onward and the first known example of an orrery was built circa 1704 by George Graham and Thomas Tompion. An early example of such a device was later made for Charles Boyle, 4th Earl of Orrery, a Fellow of the Royal Society and it is from him that the device aquired its name. By the way, I do enjoy the website and the archaeology, just not ‘Bad History’ lol. When you say, “It is nothing less than an orrey,” but then downplay its existence, as not being a computer, wouldn’t it be better to say, “It is nothing more than an orrey,” (or “planteria”)…? My dear woman, it is nothing less than an alien device! If Hannibal is correct on all the other counts, then I a complete rewrite is in order. Make the site the best it can be, because we love the site. Woulnt it be lovely to have a record of who it might have belonged to. It looks even specialized today and I imagine a pretty penny would be paid for its construction. Who knows what scholar may have gone down with the ship. This is another one of those situations that makes me feel like we “know” so very little about our past. Here you have a lovely piece of machinery which could tell us so much about the time and people from whence it came, and it took 110 years for scientists, with all of modern technology (I assume) at their disposal, to truly figure it out, mainly because of the severe damage time and the ocean wrought upon it. Who knows what has been lost to time? The evolution of science is like watching sports, ANYTHING could happen at any moment!! It’s so exciting! The displays of the Antikythera Mechanism are geocentric, but the gearing seems to be heliocentric: the main drive wheel is the sun wheel, and the others depend on it. But it clearly was designed to show the position of the sun, moon and planets, as seen from Earth, at any moment in time. Almost all commentators assume that the user dialled in the time, and read off the positions of the heavenly bodies. But if you want to know the latter, why not just look up at the sky? My tentative hypothesis is the converse: the user measured the actual positions of the heavenly bodies, set the Mechanism until it matched, and then read off the time. Why? Because the time told by the heavens is the absolute, true and mathematical time of Newton, and if you know both that and the local (sundial) time, you can compute your longitude. Perhaps the makers of the Mechanism anticipated John Harrison’s marine chronometer by 2000 years! It depends on how you want to define “computer”, I suppose. The word computer is from the Latin word computare meaning to count , since the device is a sort of astrological device that computes the stands of the planets …. is it an computer ..
Well, that definition is something that me and my fellow computer scientists continue to squabble over. 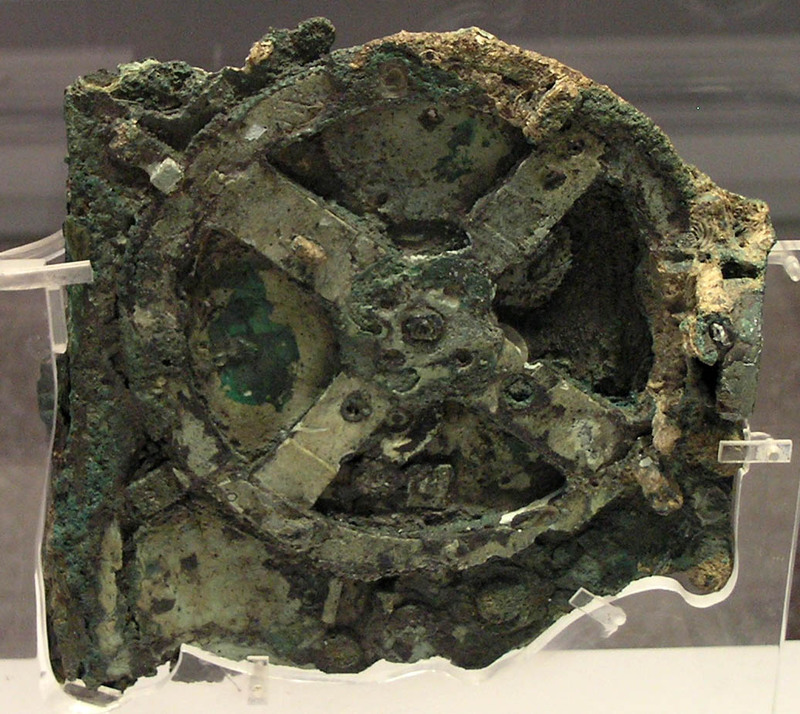 The Antikythera device would probably best be described as an analog computer,because it uses a physical process to produce a continuously-valued output. The Antikythera device is none of these, and referring to it as a “computer” implies otherwise. However, it does raise one important point- computers do not, in fact, need to be electrical in nature, and (while very difficult and probably impossible for practical reasons) one could theoretically build a clockwork computer that functions identically to my laptop! I saw a replica of Zuse’s Z1 mechanical computer a few years ago in Berlin…it is the most incredible thing I’ve ever seen…and a great example of what you just stated about what people automatically thinks a computer is – it did run on electricity, though, but with mechanical relay switches I am sure it could’ve somehow run attached to a steam engine! 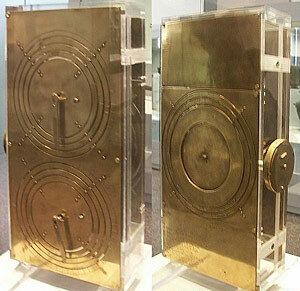 To me the Antikythera mechanism is the world’s oldest preserved clockwork. Incidentally, the word “mechanism” is derived from “mechane” meaning “invention” in Ancient Greek. It’s a little sad to see that pretty much the only thing on this site that isn’t a hoax or a fraud, but a real artifact, is so brutally dumbed down by the writer. It’s an amazing machine no matter how you look at it. It dates back to 200 BC, the inscriptions on it seem to point in the direction of Syracuse, and some scholars think it may even have been designed by Archimedes. The principles of gearing were indeed known to the ancient Greeks, but no one ever assumed they used gearing at this scale and with this kind of complexity. The article should be rewritten or maybe even ditched, seeing as how it’s not a case of bad archaeology at all. It’s the real deal and one can only be amazed by how close the ancient Greeks came to our modern, technological times. The first computer was a human. The Antikythera mechanism can’t show a Ptolemaic planetary system since it was manufactured at least 150 years before Ptolemy was born. Perhaps it was based on the geocentric system of Hipparchus. It appears that you are cherry picking the data. Just as you have accused others you are in fact engaging in the very same emotionally driven manipulation of the facts at hand. And, btw the Antikythera Mechanism did indeed calculate the Egyptian Calendar of 365 days, which is established in a heliocentric solar system (the earth does rotate around the sun). It appears that you have twisted the facts to support your dubious logic which further demonstrates how you are cherry picking the facts to fit your limited understanding of the subject. The Antikythera Mechanism demonstrates to the operator possessing, and operating the mechanism- as to their position on the earth. The mechanism is missing gears and additional pointers. It is a unique opportunity to have to visit the National Archaeology Musem in Athens to actually see the mechanism (despite it’s missing parts).